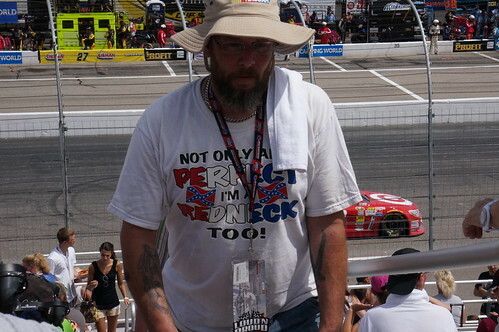 You are here: Home / Blog / She didn't say "redneck"
Aaahh, a perfect redneck in New Hampshire !, a photo by Hazboy on Flickr. I’ve been at the Type-A Bloggers conference here in Atlanta this weekend. I was invited to teach a hands-on session and also to take part in all the other conference sessions and activities. It’s been a great experience, and an eye-opening one with regard to writing, marketing and generally inventing – or reinventing oneself. I’ve met several people I’d like to stay connected to. I smiled. I’m thinking to myself, “You mean like Douglasville and half of Georgia?,” as well as that I’m pretty open-minded about music and have eclectic taste that includes some country music every now and then. Even better was that the young lady was from Massachusetts. While decrying the type of person that greater freedom and liberty allows to exist, she extolled the virtues of New Hampshire’s tax-free shopping that saves even MA residents an amazing amount of money. I just grinned.